Distinction Hotels is excited to announce the newest addition to its New Zealand owned and operated hotels – the luxury Distinction Christchurch Hotel is NOW OPEN. With 2 central Whangarei hotels located opposite the bustling Town Basin Marina and the iconic Hatea River it's easy to see why business travellers and holiday-makers alike "LOVE IT HERE". One of Dunedin's most historic buildings is now one of its most charming and loved hotels. Centrally located in the rejuvenated and vibrant exchange area in the heart of the city. 2 Distinction Hotels provide stylish accommodation & FREE unlimited WiFi, in one of New Zealand’s most popular scenic areas - Te Anau, gateway to the stunning Milford Sound & Doubtful Sound. Unwind after a busy day in these new refurbished Superior rooms at Distinction Hamilton. Ideal for business travellers or those seeking a relaxing getaway with their partner. Sleep easy knowing you and your mountain bike are taken care of at the 4 star Distinction Rotorua Hotel which offers FREE resort like facilities for you to relax after a day on the trails. Distinction Fox Glacier offers luxury accommodation in a modern, purpose-built hotel surrounded by stunning mountains. Sumptuous breakfasts are served each morning in preparation for your day of adventure + enjoy FREE unlimited WiFi. Located in the heart of the CBD, Distinction Wellington's 89 apartments boasts stylish contemporary design, superior space, and modern conveniences including kitchen and laundry facilities + FREE unlimited WiFi. Nestled in a quiet Lake Wanaka location with wonderful mountain views, Distinction Wanaka offers stylish, self-contained, serviced 1, 2 and 3 bedroom apartments, each with a high level of personal comfort and convenience, perfect for all seasons. Two 4-star Distinction Hotels situated in the heart of Palmerston North’s buoyant CBD present a range of hotel & motel accommodation + FREE unlimited WiFi. Ideal for those who appreciate great value, convenience and excellent accommodation. The Distinction Hotel Group prides itself on providing an international standard of hotel accommodation for the discerning traveller. 100% New Zealand owned and operated, the hotel chain provides an outstanding level of service and a warm, friendly atmosphere for guests. Our goal here at Distinction Hotels is for every visitor exploring the beauty of New Zealand’s most captivating regions to stay in comfortable, quality accommodation with the highest standard of service. 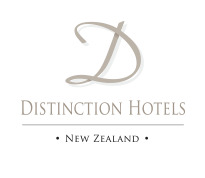 Distinction Hotels NZ currently offers twelve premium 4 - 4.5 star hotels and apartments throughout New Zealand in Whangarei, Hamilton, Rotorua, Palmerston North, Wellington, Lake Wanaka, Fox Glacier, Te Anau, Dunedin and Christchurch. All hotels feature elegant accommodation and comprehensive conference venue facilities. In 2011 the group launched their 'sister' Discovery Hotels brand. Discovery Hotels offer a range of great value 3 star accommodation options to suit all travellers, combined with true outstanding 'Kiwi' hospitality. Discovery Hotels are currently located in the North Island's Whangarei. Become a preferred member of the Distinction Hotels D-Club and you will receive instant discounts on the best available room rate of the day, every time you book direct at any of our New Zealand owned and operated hotels + receive exclusive offers through our club e-newsletter. Join our D-Club for FREE today. Enjoy your Easter Holidays in the Manawatu. SAVE 15% when you stay between 18 - 28 April 2019. Includes FREE unlimited. Hop to it, as this deal won't last long! Explore Glacier Country this April, May & June and SAVE 15% at Distinction FOX GLACIER when you stay 2 consecutive nights. Includes full cooked breakfast for 2 people. FREE unlimited WiFi + complimentary undercover car parking. Perfect if you're attending any of Wellington's myriad of events. The best family escape in Rotorua! This all in one package includes Dinner, Bed & Breakfast and more! From $298 for 2 adults & 2 children. Experience a unique nature experience & nurturing hospitality. 1 night in a Studio & breakfast + Otago Peninsula Wildlife Tour & more. From $439 for 2 people. Stay longer in sub-tropical Whangarei for less every weekend, not just on a public holiday! Superior Studio & daily breakfast for 2 people at Discovery Settlers Hotel Whangarei. 1 night + 3 course dinner, bottle of wine, breakfast, late check-out, 1 hr spa & sauna session + FREE unlimited WiFi. Perfect for business travellers... Stay in a new Superior King Room at Distinction HAMILTON & enjoy a delicious breakfast for 1 person. Includes FREE unlimited WiFi and complimentary access to the hotel's leisure facilities. Perfect for date night with your significant other, special anniversary, wedding or honeymoon gift. 1 night in a Superior 1 Bedroom Suite, bottle of wine & cheeseboard, dinner & breakfast for 2 + FREE valet carparking. The original vaults of Dunedin's former Chief Post Office, now the Distinction Dunedin Hotel have been converted into private dining rooms. Setting the scene for intimate dining and special occasions that require a unique touch of timeless elegance and nostalgia. With a purpose-built lakefront chapel, this modern & elegant Distinction Hotel offers you a luxurious all in one wedding location including ceremony, reception and accommodation. Distinction Te Anau will create a wedding that is distinctively yours. An adventure run over New Zealand’s world famous Routeburn Track. Distinction Te Anau Hotel & Villas are pleased to offer competitors and supporters discounted Te Anau accommodation rates. Book now. Have your ski rental gear delivered & fitted in the comfort of your Distinction WANAKA apartment this winter. All serviced apartments offer a private car garage, ideal for drying and storing ski gear. Guests also enjoy complimentary use of Distinction Wanaka's spa pools, perfect for resting those weary muscles after a day on the slopes!